I noticed a lot of my readers are actually looking for the latest income program opportunity to make money online here in Nigeria? 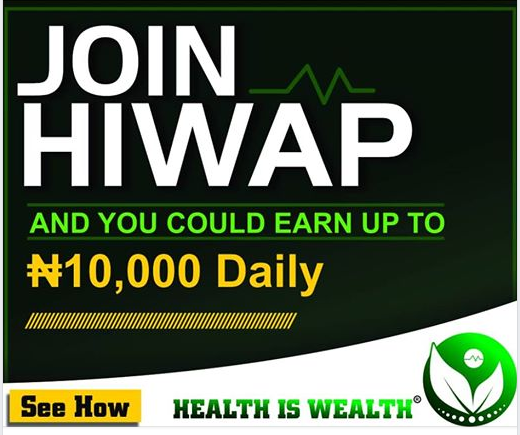 There is a brand new, super legit income program called HIWAP (Healthiswealth.ng Affiliate Program) that you can use to make up to ₦10,000 Daily Online in Nigeria. So I’ll be doing a Hiwap review right here to show you what this program is all about and how you can make money with it. The good news is that I have prepared 2 special bonuses in form of eBooks for any one of you who registers and upgrades for HIWAP using my referral link in this post. So make sure you read this post till the end in order to claim the bonuses, and the 2 bonuses are limited to only first 100 people who register and upgrades using the link in this post. This bonus will allow you to earn more on HIWAP. Below are my 2 special bonuses you are getting for free. 1 HIWAP Review by Prosper Noah, Top Affiliate Marketer in Nigeria. 1.2 How does HIWAP (Health is Wealth Affiliate Program) Work? If you signup for HIWAP straight away and upgrade your account using my link in this post you are getting this 2 bonuses sent to your email within 24 hours. Because Thousands of people are reading this post right now. After first 100 people, I will stop giving out my bonuses and it will end by 20th April, 2019. Just send me an email after you have signed up for HIWAP using my link and also upgraded your account, and I will confirm and send the 2 eBooks to you. WARNING: Don’t email me if you didn’t upgrade your account, I will only send my bonuses to people who actually registered and also upgraded via my link. HIWAP Review by Prosper Noah, Top Affiliate Marketer in Nigeria. HIWAP means Health Is Wealth Affiliate Program and was launched earlier March 2019. In summary, they are Nigerians who desire to create options that work and online earning opportunity for the growth of Nigeria economy. Healthiswealth.ng is co founded and managed by Samuel Joy (A certified human nutritionist and personal health consultant) in partnership with Paul Samson PSO, the founder of NNU.ng, one of the top 10 most visited websites in Nigeria. Health is wealth project is fully managed by great minds and brilliant content managers like Egu Chris and Emmanuel Obiji and some other top members and great writers. – According to their about page. I have checked the whole of this website and since Paul Samson is in partnership with them, then they must be very, very legit website. Though there are other secret features I use in discovering what websites are legit or scam, I won’t tell you those secrets though, if you like goan hit your head on the wall Lol..
How does HIWAP (Health is Wealth Affiliate Program) Work? I have registered to the program myself. Now you need to read this slowly and carefully follow to know what you stand to benefit when you join Hiwap. and this is where my bonuses is going to help make you a lot of money as well. There are different ways to earn money in the healthiswealth.ng affiliate program and I will share exactly how with you. Yes, that is the membership fee. You can earn and cash out by writing article for them (₦1,000 per article): That’s N10,000 everyday for 10 articles. And N300,000 every month just by writing articles for them. You can cash out your earnings without referrals as well. When you earn up to N5,000, you can withdraw your earnings straight to your bank account and they pay every Friday. So you smile to the bank every Friday. Don’t forget that you are getting my 2 bonuses if you use the referral link in this post. So follow the below tutorial on how to register for hiwap and upgrade. The website page will open. Step 3: Fill the registration form carefully and correctly, put in your correct details like name, email etc. Step 4: Go to your email and click on the activation link sent you by HIWAP. Finally, make payment of N2,000 for HIWAP Epin to any of the ePin Distributors banks for to upgrade your membership in order to be eligible to make money. There are lots of ePin distributors, but I trust the lady named Amaechi Uzoma. So you can send the N2,000 to her account to get the pin you will use in upgrading your hiwap account. As soon as you pay, she will give you a Pin to upgrade your account. After she’s sent the pin to you, follow below to upgrade your account. You will see a message that says Upgrade Membership Successful. Then Log out of your account. Login again and start earning. After you upgraded successfully using my referral link then send me an email to [email protected] for the 2 Bonuses. Again be warned; If your account is not upgraded, don’t send me any email. After I confirm that you registered and upgraded using my link, I will send the 2 bonuses to you within 24 hours. Again below are my bonuses you get when you register successfully with my referral link. Note: I will remove my bonuses by 25th of March, 2019. Make sure you go register, upgrade with your N2,000 and claim my 2 bonuses above. Drop your questions in comment section, just in case you have any and I will reply to you as soon as possible. I hope my Hiwap review and special bonuses helps you make more money online here in Nigeria easily and fast. Read the post well, before you comment. You don’t have to refer anyone and even if you have to refer, my bonuses will solve everything for you easily and fast. Please reply… Must you refer someone before you cash out? Check my reply to the guy above you. How can one go about the articles. Which column do u write it or post. After paying the money how will I refer someone? Your referral link is in your Hiwap dasboard, Copy it and use the strategy in my Bonus to promote and make money for yourself. Did you read the post at all? Read it and follow the tutorial to register and upgrade. The article writer tool that you promised to give as bonus, can one use the same tool to write articles that will rank well on one’s personal blog? Will the article be 100% unique? Without paying 2000 u cant earn?? Well, I have given you the best option on this post. You could try with your card if you see any option for it in your dashboard. Powerful! i would have loved if you can tell us how you check legit or scam websites. also based on your offer, how long is it gonna stay bro? Check the date for the offer expiration. Thanks boss for this crazy bonuses. They are totally worth it! Please can you extend a grace for upgrading to tomorrow please? I don’t want to miss out but I will have my cash by tomorrow. I’d really appreciate it if you agree sir. Thank you! Can one also pay to any other epin distributors aside Uzoma. And will the bonuses still be available for anyone who uses the epin distributor name as sponsor! You have to do exactly what is stated in this post to get bonus. Just register and upgrade following the instructions on this post. You will get the 2 bonuses. I’m i still entitled to your bonus? Yes, if you upgrade, then send me your email to get the 2 bonuses. Make sure you follow the instructions on this post carefully. How do I get bonuses from you? I’m ready to to follow all that you’ve clearly stated Snr.. my own question is about referral.. so if the person I referred hasn’t upgraded (i.e pay the 2k for membership) can I get the commission for the referral or it’s only paid when my referral finances his/her account? I’ve upgraded using your link…. If you followed the instructions in this post and sent am email, then I’ve sent the bonuses to you. Read this post well again. Hello sir prosper Noah, thank you once again for an exciting review. I believe anything you post because the last I got on the setting of a PayPal account that can work in Nigeria works extremely well. I’m just seeing your post today, can I still sign up through your referral link and receive your bonuses? I’ll really love it if you can send the bonus when I register through your link. Yes sure, go on and be fast about it. Thanks Prosper for the well explained post. I am actually seeing this for the first time. I will like to register and upgrade based on your specifications using your link. Please I will appreciate if you will still send me the 2 bonuses to enable me do better on this project. Thanks once again. Go ahead following the instruction on this post. I messaged you concerning my upgrade using your referral link, and you haven’t responded. I followed your guide, paid the N2000, to Uzoma, upgraded using your referral link and yet to receive your bonuses. I will rather appreciate it if you come out plainly and tell me the situation about your bonuses rather than remaining silent to my messages and email. If you are doubting my claims, check your back office for the username – chronicles. I travelled for easter and spent 4 days. I’ve upgraded using your link yet I haven’t seen anything.